Register now for the Arizona Public Policy Forum from 1 to 8:30 p.m. Wednesday, Feb. 20 at The Newton, 300 W. Camelback Road, Phoenix. Got advocacy experience? Want to GAIN advocacy experience? 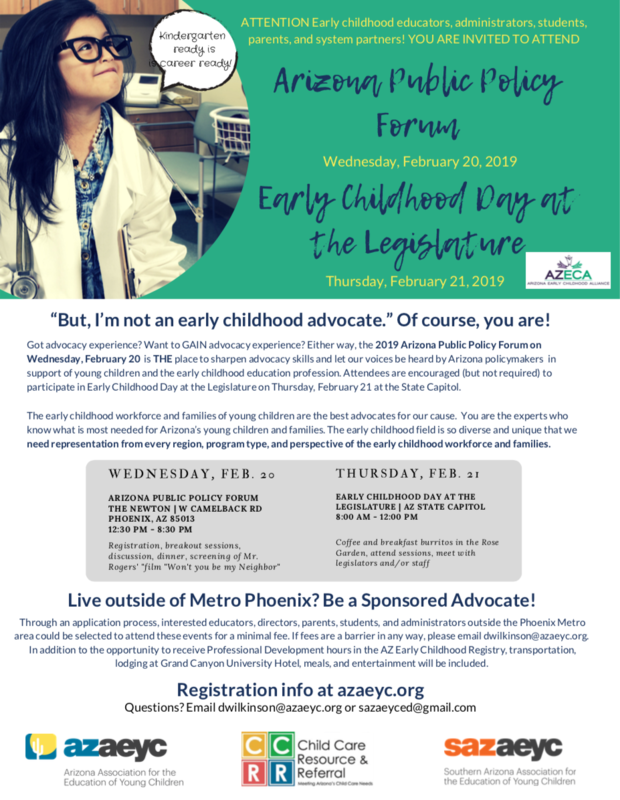 Either way, the 2019 Arizona Public Policy Forum is THE place to sharpen advocacy skills and help move a nonpartisan agenda in Arizona in support of young children and the early childhood education profession. The Early Childhood Day at the Legislature will be held Thursday, Feb. 21 at the Arizona State Capitol. Network with friends and legislators, as we show how early childhood development and health contribute to healthy children, third grade literacy, enhanced economic development and strong communities! This is a vital opportunity to show policymakers how early childhood links to their priorities and the impact early childhood investments have made in communities across our beautiful state. The intention overall is to introduce partners, stakeholders and other early childhood professionals (like you!) so our voices will be heard at the Arizona Legislature. Live outside the Phoenix Metro area? Through an application process, interested educators, directors, parents, students, and administrators who reside outside the Phoenix Metro area could be selected to attend the event for no (or minimal) fee. CLICK HERE or on the flyer above for more information on both events.